This is a rather well-known album, yet I think my blog would be incomplete without a review of it (won't post a download link, though; you'll easily find it elsewhere if you want). Håvard Ellefsen a/k/a Mortiis is mostly known for playing bass in Emperor, and for his dark ambient works from the 90's (including released under other monikers, such as Vond, Cintecele Diavolui, and Fata Morgana). Personally I find his ambient stuff to be rather average, except maybe for "The Stargate" (not saying it's bad, but there's a lot of better dark ambient around). "The Smell Of Rain", on the other hand, is nothing short of a masterpiece. 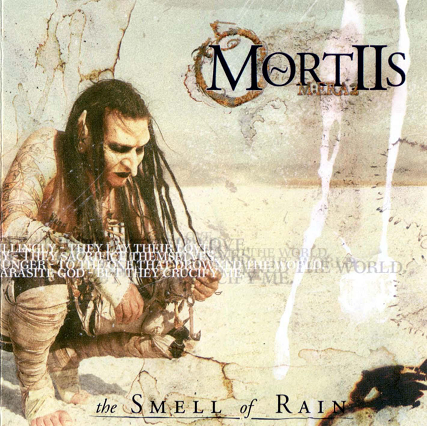 Surely it's much more accessible to an average listener than any other stuff from Mortiis (its sound even borders on synthpop at times)... but who cares? After listening a lot of "gothic" music of all kinds, I can name only very few releases with such esoteric/"otherworldy" feel to it, and "The Smell Of Rain" is certainly one of them. Too bad there isn't a lot of music that sounds like this exact album. Mortiis has released two more albums since then, but that period (early 2000's) was very bad for his personal life, which had strong negative impact on his music. Well, "The Grudge" isn't as awful as you might think after reading some reviews - but it's nothing comparable to "The Smell Of Rain", just average industrial rock. As for the music from other bands that came close to this kind of sound, I can think only of some tracks by The Electric Hellfire Club.